It’s that time of the year again. It’s time to eat dirt. 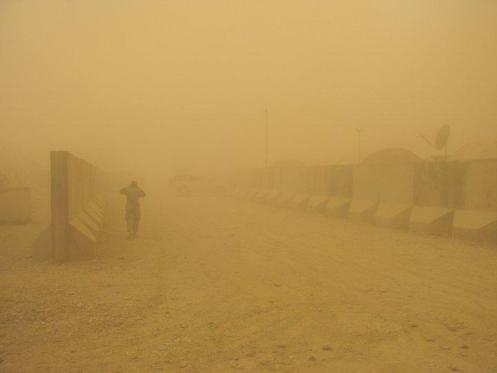 At least it is in Afghanistan, where the summer sandstorm season is underway. The photograph above was posted recently on the Facebook page of 1st Battalion, 5th Marines, depicting a sandstorm in Sangin district. As noted on Battle Rattle last year when I was downrange, the season is known as the “120 Days of Wind.” It runs from late-spring through Afghanistan’s hot summers, whipping up storms on a regular basis that suffocate light, halt air traffic and prevent some Marines from going on patrol. After all, if a squad was pinned down under fire without the possibility of air support, things could get ugly in a hurry. As a bonus, here’s a photo I took of a soldier braving a sandstorm last June at Camp Leatherneck, the Marine Corps’ main hub of operations in southern Afghanistan. It also goes to show you that even though Leatherneck is a Marine base, there’s a strong joint flavor there, too. Just another challenge the wonderful folks in the corps take on as they gladly serve our country…!